Troy “Trombone Shorty” Andrews was a child prodigy who began playing the trombone at the age of four, a discarded trombone that was twice as long as he was tall. By age six he was leading his own money-earning band, and by ten he was a bona fide touring musician. Today, at 30 years old, he is a Grammy-nominated multi-instrumentalist, playing not only trombone, but trumpet, drums, organ and tuba with his current band, Trombone Shorty and Orleans Avenue. Andrews credits his singer-songwriter grandfather, Jessie Hill, and his bandleader brother, James Andrews, as significant influences. Of his brother James—also a trumpeter—he often asserts, “He taught me everything I know.” Young “Shawty” performed with many heavy hitters, including Bo Diddley, Wynton Marsalis, and Wycliffe Gordon; he learned much about the craft of making music through their mentorship. Over the years, however, Andrews has blazed a distinctive path in the jazz world, fusing elements of modern rock and hip-hop to formulate a sound he calls “SupaFunkRock”. At the same time he’s been forging innovative sounds, Andrews has also maintained his dedication to New Orleans by working to preserve its musical traditions. For the city he says “raised him”, he has established the Trombone Shorty Foundation “to preserve and perpetuate the unique musical culture of New Orleans by passing down its traditions to future generations of musicians.” The foundation sponsors two intiatives in particular: The Fredman Music Business Institute (providing top-level music industry training to high school students) and Trombone Shorty Academy (a partnership with Tulane University to provide musically gifted high schoolers with mentorship in various areas, including reading/writing music and performance). In line with his mission to perpetuate New Orleans’ unique musical culture, Andrews has written an autobiographical picture book: Trombone Shorty. It is the story of how a young Troy Andrews became Trombone Shorty, and how practice and persistence transformed a dream into the reality of being an internationally celebrated artist. 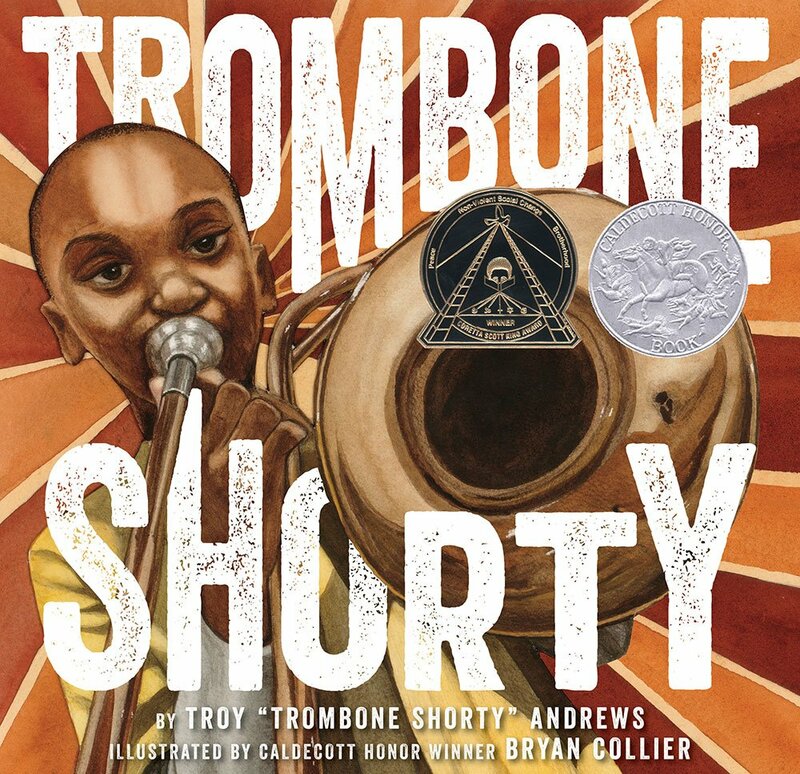 Trombone Shorty—illustrated by Bryan Collier and published by Abrams Books for Young Readers—is a 2016 Caldecott Honor Book and winner of the 2016 Coretta Scott King Illustrator Award. Celebrating New Orleans culture and allowing others to see Louisiana as a place other than where people were drowning, poor, and dying is also dear to my heart. My fifth grade students loved Trombone Shorty!